Julian Moody was an innovator, pioneer, and veteran of a professional field whose earliest traceable roots began to appear in America in the late 1930’s. This field includes: executive coaching, leadership counseling, organizational counseling, management counseling, as well as other similarly titled professions and offshoots such as life coaching. Julian was one of the first in his field to recognize that transformation of an organization begins in individuals, most especially leaders. His approach was to affect change within individual presidents and high-level managers and these changes, in turn, brought about dramatic improvements in the companies. This was a radical idea for his time. For fifty-two years, Julian personally worked with hundreds of presidents, executives, managers, and board members of numerous companies and organizations in America. For sixteen years, he served as a senior partner and president of Adams, Lafferty, Madden, & Moody, a well-known firm in the fields of corporate counseling, management development, and executive education located in Ann Arbor, Michigan. Even more impressive than his career was his longevity. Julian lived to ninety-two years of age (he passed away on September 5, 2009). Up until the last six months of his life, he volunteered countless hours of his time as a mentor and coach to individuals, families, and nonprofit organizations. 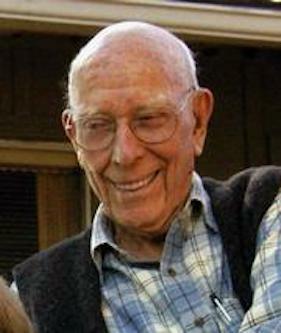 He was very respected and popular in Santa Barbara, California where he had lived since 1965. Brandy was fortunate to meet and befriend Julian in 2007. Their time together eventually resulted in a collaborative project. Brandy was particularly interested in Julian’s business background - his broad and lengthy experience gave him a firsthand view and unique perspective into the dysfunction that plagues modern business. In a career built by word of mouth, he gained entry into the executive offices and boardrooms of numerous companies and organizations in America. There, he was able to examine some of the root causes of problems we contend with on a day-to-day basis. And with this experience, he came to question some of the habits and beliefs that drive us as a culture, but that we don’t give much thought to in our relentlessly busy routines. Brandy was also interested in his life experiences and how they formed his innovative career, as well as his thoughts on other topics such as education. At heart, what became the project simply began as questions Brandy asked out of her curiosity. The ensuing dialogues were eventually organized and edited into a collection of topics. In the limited time they had with each other, Brandy did her best to concisely capture the essence of one man's experience in a way that is relevant to our times. Julian worked primarily with presidents and top executives, but his insights are relevant to all of us since we are each leaders of our own individual realms. Topics from their project Dialogues with Julian Moody: On Life, Business, Sustainability, and Other Things will be posted one by one in the coming months and available to view free of charge. Brandy hopes you are blessed by Julian's experiences, observations, and insights, as many other people have been.